Vibrant Performance Inline Oil and Fuel Filter Sets are manufactured from 6061 Aluminum Alloy. Their compact design makes them easy to install in even the tightest of spaces. 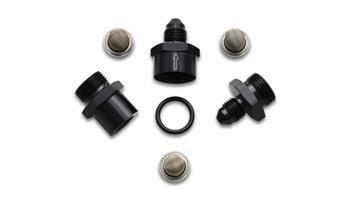 We include both Male and Female adapters for ultimate flexibility for the installer. We also include a 30 micron, 80 micron and 150 micron filter element, allowing you to use them with a wide variety of flowing media. The 30 micron filter is best suited for lightweight engine oils and pump gas. The 80 micron filter is recommended for heavier weight oil, alcohol and ethanol fuels. The 150 micron element is ideal for power steering and transmission oil. Available in Anodized Black only.